The Bible is a book that speaks to us on many levels. It speaks to us today just as it spoke to the early Christians. And because it's God's Word, it speaks with authority as the only unquestionable rule of faith and life. Why is it so important to submit to the authority of Scripture? One of the key reasons why we should submit to the authority of Scripture is simply this: because Jesus himself did. That is amazing. In Jesus' own ministry you see him saying time and time again, "It is written…"; "It is written…" That's how he answered Satan in the temptation narrative. He's still quoting Scripture on the cross: "My God, my God, why have you forsaken me?" So out of the depth of Jesus' being, on that occasion, comes Scripture. His was a mind which was saturated with Scripture. He prayed to God using the words of Scripture. He allowed Scripture to dictate, if you like, the path of his own ministry. Now if that was true for Jesus, how much more it should be true for us? And when you think of who Jesus is, Jesus is, if you like, the subject matter of Scripture. He is that about which the Scripture is written. These things point to him. More than that, he's actually the subject of Scripture. He's the one who creates it, who writes it, who inspires it. I believe that Christ stands behind all of Scripture. And if that's the case, he himself submitted to Scripture, how much more should we? Think about it. Jesus also described as himself the "Word of God," John 1. The Word of God? He himself submitted to the written word of God. Well, this is amazing. We can't understand it in a sense. But it just shows how important Scripture is. And I'm really impressed by the fact that in Luke 24 when the risen Christ is there with those Emmaus disciples on the road, what does he do? He gives them a glorious Bible study, and he takes them back and says, "It was written…" — It is written that this is would happen, and now I have fulfilled it — And I think there's a very important lesson there. Jesus is, if you like, saying, don't make the mistake of saying, "hey, we've got the risen Christ, we've got the Holy Spirit, who needs a dusty old book like that?" Instead, he's saying, even though I'm arisen from the dead, even though you can have a personal relationship with me, you need a book to guide you. And I'm giving you this book. You've got the Old Testament already. I'm going to give out my Spirit and enable the New Testament writers to write about me, to write an authorized biography of Jesus. They're going to do that. You need the book. And if Jesus says that, then we do indeed need it. In Psalm 119:105 it says, "Your word is a lamp to my feet and a light to my path." That's saying God specifically designed the Bible precisely to give us definitive guidance in our whole life. If we're not going to listen to it, if we're not going to obey it, if we're not going to take it to heart, we're going to foul our lives up. I mean, this is really important … Scripture is designed to overcome sin, and that means submitting even when you don't like it, when it cuts against the grain of your own sinfulness. That's one of the most important areas where we should be submitting. If God talks, we should listen, and we should be responsive. So, the authority is not a response to words in a book, which is sometimes what people are accused of when they respect the Bible. Rather, the response is a personal response in the context of your personal relationship with God, recognizing that God has every right to direct your life, and to lead you, and to give you instruction and wisdom, and to encourage you, all those kinds of things. And that's what the Bible is seeking to do. So I would be foolish not to be responsive to the authority that is inherent in the inspired Word. Well, accepting and acknowledging the authority of the Scripture as the foundational starting point for all theological reflection and doctrinal claims is important because of what the Scriptures purport to be telling us, and that is this: that God has acted in history. We have to remember that the Scriptures aren't comprised of a set of great religious insights or moral claims. Take like the Quran or the writings of much of the Hindu scriptures or Buddhist writings, those are basically moral proclamations or religious insights produced in the mind of what we might call a religious genius, the Buddha or Mohammad. But the Scriptures say God has acted in history, and in these acts — the act of calling Abraham, the act of delivering Israel, the act of sending judgment upon Israel through the Babylonians, the act of bringing Israel back to Jerusalem, ultimately the act of becoming incarnate in the virgin Mary, of being born, of Jesus dying on the cross literally, physically, historically, rising from the dead literally, physically, historically — those are historical events that the Scriptures say they are reporting on. Now it's important to submit to the teaching of Scripture if the teaching of Scripture is telling us about what God has done. The Scriptures then are our only access, our only access in written form to the account of what God has done to reveal himself… That's the only access we have to God's mighty acts of self-revelation. Therefore, the Scriptures themselves become the revelation of God to us. When we come to any text, whether it's a novel, personal letter, or a newspaper, we instinctively want to know the message and how it might relate to our lives. The same is true when we come to interpret the Bible. We want to understand the meaning and possible application of what we're reading. Given the uniqueness of Scripture, what are the most important hermeneutical principles we should follow? The most important principle for evangelical interpreters is to be serious with the text, that you really want to understand the text in its original meaning as how the first recipients heard it. And that you really faithfully convey it to people living in a totally "other" context, in such a way that it impacts their lives and enrich their lives. And the most important issue is to bring them in a closer relationship with the real author of the Word, the Lord Jesus Christ. When I have opportunity to teach in the classroom, or in church settings, or even with my own family, the sort of the basic principles for interpreting Scripture, I always go back to five fundamentals. The first is "clarity," understand that God wants us to understand his Word. He wants us to know him. He has communicated in languages that we can understand. The second is "unity," that we lean into the Bible expecting it all to be one consistent story, not expecting to find contradiction. Complementarity and different emphases, yes, but it's all going to fit together. Clarity and unity. Third is "grace," to understand that the pattern of Scripture is to show us our need of God, how he has met that need, how he has provided for us ultimately in Christ, and how we are to respond to his provision. And then after that we'd move to "context," the sense that while all of Scripture is one coherent whole. When we look at any part we can better understand it if we see how it connects to other parts. So, context, how does it connect to history, culture? How does it connect to other passages around it? And then finally — a principle that I'm stealing from Augustine way back when in church history — the principle of "charity." He emphasized that all of Scripture is designed to help us to love God and love neighbor. And if we're not using the Bible in ways that helps us grow in love for God and neighbor, then we're misusing Scripture. So, there are lots of things we could say about important principles for interpreting the Bible. But I think if we get those five down, they'll never mislead us or take us astray. One of the questions I get asked all the time is, "What principles do Christians need to use to interpret the Bible?" And I usually sum it up by saying, "Context is key." You've got to have the right context if you're going to understand the Bible. But context is multilayered, and one of the things I tell people is, there's really three different contexts that you use to interpret Scripture. First is the "immediate context." You want to make sure that you understand that passage and the surrounding texts right around it. What argument is the author making? What book does it fall in? Things like this. The second layer of context is what I call a "canonical context," or maybe a redemptive-historical context. Where does that passage fall in the larger Scriptures? And so, when you're interpreting one passage, you use other passages of Scripture outside of that immediate locale to interpret it. And the third layer of context is what I call an "ecclesiological context." We don't interpret Scripture in isolation from the church. We interpret Scripture in conjunction with the church, both in the present and also throughout the ages. What have the church fathers said about this passage? What have theologians said about this passage? What's the collective wisdom of God's people about this passage? Now, when you look at all three of those levels of context together, they really work in a harmonious way to help people understand what the Scripture says. And a mistake can be made in any of those three areas. But if they're all checked, usually that can lead us to a good understanding of what that passage says. We all come to the Bible with personal experiences and ideas that shape the way we read it. And many of our interpretations may seem good and right to us initially. But, they must always be checked against what the Bible actually says. Why aren't our interpretations of Scripture equal in authority to Scripture itself? Our interpretations of Scripture are accountable to the authority of Scripture in a way that Scripture is not accountable to the authority of our interpretation. Now, we want to be careful how we understand that. We don't want to indicate that we cannot understand Scripture accurately where we do understand Scripture accurately and repeat it back in terms that might be different than the terms Scripture uses. For example, the word "Trinity" as a summary of what the Scriptures do teach about God. Even when the Scriptures don't use the word Trinity, we would understand our interpretation to be an accurate interpretation. But we always have to allow our interpretation to be accountable to the Scriptures themselves. It is possible to misinterpret. It's possible to not consider all of the relevant data. It's possible that there is some piece of information that we're missing about the historical situation of the original text itself. And so we always want to understand that our interpretations are revisable in light of what Scripture teaches, and we come back to that authority again and again and again to correct possible misinterpretations, nuances. And in this, the teaching of church history is very helpful because it points out ways in which people throughout the history of the church have both gotten major doctrinal issues right and major doctrinal issues wrong. And so we stand in a stream of witnesses, a stream of inheritance, so to speak, of handling the Scriptures. So we're not interpreting the Scriptures in a brand new way absent of context of, say 2,000 years, of church history. So we can correct our interpretation by looking at what other good Bible interpreters have had to say over the years and use them as conversation partners, but always appealing to Scripture itself as the final authority. In the Wesleyan world, we have talked about the Wesleyan quadrilateral, which means "Scripture, reason, experience and tradition." And some people got that out of whack to think those are four equal things, that Scripture is the same kind of authority as reason, same kind of authority as experience, and the same kind of authority as tradition. But it wasn't so with John Wesley, and it wasn't so for evangelicals since John Wesley. We have always said Scripture is number one. And then underneath that Roman numeral, so to speak, is: A, B and C, which would be reason, experience and tradition. So we look at Scripture to say, alright, that is our authority. Is there something in our brain that can help us understand that? Some kind of reasonable dynamic that we can understand Scripture? Yeah, sure. Can tradition help us to understand Scripture? You bet. Can our experience help us to understand Scripture? Yes it can. But, Scripture is always the final word, not reason, not experience, not tradition. Always the Bible. In many ways, interpreting the Bible is unlike interpreting any other book. We need to consider many factors when we come to interpret a passage of Scripture. And perhaps none of these factors is as important as a passage's meaning in its original context. With everything else to consider, why is it so important to search for the original meaning of biblical passages? Searching for the original meaning in biblical passages is critical because that's where our basis of divine authority is. If we don't know what God intended in a passage of the Bible, then we can't say what its meaning is for us today. So, original meaning is a critical starting point for making modern application. And, in fact, saying the Bible means things that are contradictory to, or even outside of original meaning can be one of the most unhelpful and even self-serving things that people do in the church. God in his wisdom chose to reveal his Word in specific historical contexts over hundreds of years. God gave his Word to prophets. God gave his Word to his apostles, and this Word was communicated to the living audience of that day. For example, the apostle Paul. When he writes to the Ephesians, God's Word comes through that thinking, feeling person, Paul, such that Paul is instructing them, and he's warning them, and he's passionately pleading with them. And yet the very words that he's using in his letter are the exact words that God wants chosen. Now as we look at this, we seek first to understand what the original writer, the inspired writer of Scripture, was intending to convey to that original audience. What was Paul seeking to teach the Ephesians? What error was he correcting? What truth was he impressing upon them? And then that sort of makes a channel, a channel in which all legitimate implications that we have flow today. A wrong approach to Scripture is just to kind of jump down into it and, "Oh, this makes me think of this," or "Suddenly I feel this," as opposed to, say, "Well, you know, God gave his Word in history and to particular persons, particular times, for a reason." And we respect that channel even as we see there are many implications, countless implications which flow out of that channel and meaning for our lives today. One of the things that has been stressed in seminary education for many years is the original meaning of the text. And if we know the meaning of the original text, it often helps us to avoid wrong applications and does help us to find the right applications. I teach Hebrew, and one of the things that I often say to my students is, "The value of your knowing Hebrew is that you'll be able to help your congregations realize what's going on in many of these cases." For instance, I think about the book of Ruth. Well, we don't thresh wheat on the top of a hill anymore. We don't have foreign girls coming into a setting in another culture in the same way. But we do see what God is saying about human behavior … Well, if we understand what was going on with Ruth — how she in her situation nevertheless cared for her mother, how she in her situation was willing to risk, really, her life on that threshing floor at night with a rich, elderly, landed, male citizen who could have raped her and left her helpless — we can see something of her courage. We can see something of her love for God and understanding what's going on in that setting, in the language. And the Hebrew word hesed is the word that means "passionate devotion" to someone to whom you don't necessarily owe that. And Ruth demonstrates that as a person who is really helpless. It's clear that we aren't able to come to the Scriptures, or any text, apart from our own beliefs and experiences in life. And one of the key factors that shapes how we see any passage is our relationship with Christ. So, how does our faith in Christ affect our interpretation of the Bible? Our faith in Christ is fundamental to how we interpret the Bible. The psalmist in Psalm 119 prays, "Lord, open my eyes that I can see." Or in Isaiah there is this kind of curse, in Isaiah 6. "Seeing they will not see, and hearing they will not hear," meaning they can read the information or hear the words but not really understand what's going on. And the point of both of those passages is that the work of the Spirit to give us faith — eyes that see and ears that hear — is fundamental to interpreting Scripture. Without a renewed heart the Bible is in some sense a condemning word against us. But once God has renewed our heart and gives us eyes that see and ears that hear, once we have that faith… we perceive for the first time that the Bible is God's message to his people about salvation through his Son. And so, when it comes to faith and when it comes to grasping the gospel and grasping the message of Scripture, faith is the necessary first prerequisite for adequately understanding and apprehending the significance of the gospel through the Scriptures to us. You search the Scriptures because you think that in them you have eternal life, and it is they that bear witness about me (John 5:39, ESV). It's very possible to be someone who can even memorize large sections of the Bible, but unless we find ourselves treasuring Christ, unless we find ourselves repenting of our sin and trusting in him for our salvation as a result of our study of the Scripture, then we are not studying the Scriptures as God would have us to do. In 1 Corinthians 2, Paul writes about how the Holy Spirit enables us to understand, how the Holy Spirit enlivens and illumines our minds to understand what is written in God's Word. Martin Luther, the famous reformer… says that in Psalm 119 we find a model for studying the Scriptures. And a third of the Psalm is calling out to God for supernatural assistance: "Open my eyes that I might see wonderful things in your word. Turn my heart and mind away from vain and worthless things." And so, apart from the work of God in our spirits, in our lives, in our minds to understand his Word and to treasure it and to see Christ as providing the righteousness we desire, then we're not studying the Scriptures aright. Our faith in Christ affects our interpretation of the Bible in profound ways. First and foremost, we have to be regenerate, born again and indwelt with the Spirit properly to interpret Scripture and to see Christ at the center of Scripture. And then a sense of a living, walking relationship with Christ, so that we are filled with him as we come to every text of Scripture. And then to try to understand the proper way that perhaps the Old Testament or the New Testament teaches things about Christ. The Spirit of Christ, the testimony of Christ is a spirit of prophecy we're told. And so, how does the book of Deuteronomy point to Christ? How does Isaiah point to Christ? How do other prophetic passages or Psalms point to Christ? And so, as we're filled with the Spirit and we have good fellowship with Jesus, we can pray through the Spirit and say, "Lord, show me yourself." We think about what he did on the road to Emmaus, how with those two disciples he opened their eyes to see everything that was in Scripture concerning himself. And he did the same thing with the apostles in the upper room. I want that experience as a teacher of the Word of God. So, I want to go to Christ by the Spirit and say, "Lord, show me yourself in Scripture." Since the Bible is living and active, it is clear that it speaks to us in our current situations. It is also clear that our personal, spiritual conditions influence our understanding of a text. How does the spiritual condition of an interpreter affect his or her ability to interpret the Bible? When we read the Bible, we are engaged in a text that goes beyond all other texts. However profound other texts might impact us and challenge us, nothing engages us in the complete and the whole man like Scripture does. I mean, this is God speaking to us … This is the most important relationship that there is. This is the thing that defines everything else, that sets the categories for everything else. And that's the level that Scripture is working in us and on us as we read it. What this means is that the whole man, the whole person is involved in the reading of Scripture. And you cannot check any part of yourself and pretend or ignore it as though that doesn't matter, that this doesn't count. No, it's quite the contrary. We must bring the whole of who we are in to the reading process. And this puts our sin front and center so that, to the degree that we're sinful, we're going to have a kind of a natural impulse to defend ourselves against the force of Scripture, against what God is saying to us, against the challenge, the correction, the rebuke, to justify ourselves, to explain these things away. And that, as Kierkegaard has pointed out one time, the problem is not that we do not understand the Bible. The problem is that so often that we understand it all too well and are unwilling to obey it and to believe it, and to entrust ourselves to the promises and so on. That's really the fundamental problem many, many times when we claim not to be able to understand the Word of God. Well, the spiritual condition of a person certainly is important in interpreting Scripture. Not that somebody who is walking closely with the Lord can just interpret Scripture without study, without putting effort into it, but… something that is essential for understanding Scripture, for letting it come into my life, is humility and submission to Scripture, to listen to what God is saying. And so, a person who is walking with the Lord closely — their spiritual condition then you'd say was good, is "walking with the Lord closely" — is much more likely to be submissive to Scripture, to really listen to what it has to say. Not to try to twist it to… what he wants it, or she wants it to say, but to really submit to the text of Scripture and let it speak to them … And that is so important. If the Scripture is the Word of God, and if it is God's message of salvation, then I want to know what God is saying. I don't want to know what I am saying. I don't want to make it mean what I want it to mean. I want to know what God is saying. And so, a submission to the Scripture is very crucial. And that, I think, is one of the main things that walking closely with the Lord does, walking and having a good spiritual condition and relationship with him does. It enables us to be humble before Scripture and see what God has to say to us. A biblical interpreter should be in good spiritual condition and mature in the Christian faith if he is to understand the deep spiritual truths in the Bible. If the interpreter is in a poor spiritual state, he will poorly express the Bible's concepts and ethical principles. But if he is spiritually mature and lives in spiritual maturity, he can deeply understand what is in the Bible because its principles, whether doctrinal or ethical, really talk about the depth of the human conscience. This requires the person to be mature in faith and spirit … That's why the apostle Paul emphasized that elders should be prepared and mature for teaching… because the interpreter's spiritual state significantly affects what he says in relation to his understanding and explanation of what's in the Bible. Approaching the Bible in a scientific, academic manner has many benefits. One of these is seeing the original meaning of the text more clearly. But when we pursue the original meaning of a passage, we often focus solely on our intellectual study of the passage and ignore more devotional aspects. How can we remain emotionally engaged with the text of Scripture when we make it an object of academic study? Academic study often does push "the mind" to the forefront and the emotions backward. But let's say it this way: we're whole beings — body, soul, mind, strength, emotions, will and mind — and therefore we should engage the whole person. You know, how do you get engaged when you've been academically studying Greek or Hebrew and the structure of a passage? One answer is, pretend you're there. If you're reading a historical narrative, imagine what it would have been like to be there when Jesus wept over Lazarus, when Lazarus came forth. So as you picture yourself being there, you will reengage the whole person as well … Another way to keep our emotions engaged is to picture the people to whom you're speaking. If you know someone in your church has just experienced a death, has just become married, has just gotten a job after a long search, feel that when you talk about work. Picture the people to whom you're ministering in your mind, the joy or perhaps sorrow they're feeling at the time. And as you remember that it's not just you and the Scripture — it's you and the Scripture for the sake of your people — your emotions will stay engaged in a godly way. Apart from the Spirit, we can't understand the mind of God in his Word. So the Holy Spirit is the gift of Jesus to understand the testimony about Jesus that's given to us in the Scriptures. And so, practically what that means is when we study the Bible, and we seek to know Christ through the Scriptures, that we have to seek that understanding of who Jesus is through the Spirit's guidance. So one of the principal reasons we do that when we study the Bible is we pray, and we remember that it's not just an academic activity, but it's a spiritual activity. And that even as we grow in grace and as the Spirit makes us more and more like Jesus, we're better able to understand that Word, too, the Spirit working in our sanctification. Many times people who are unfamiliar with the Bible assume that it's merely a boring list of rules and doctrines. But rather than finding the Scriptures dull, the Bible's human authors treasured them. So what about us? How important is it for us to love and cherish the Scriptures? It is vital for us to love the Scripture as having come from the mind, from the heart of God. God is our heavenly Father in Christ and he's speaking to us. And when Scripture speaks to us, we need to love what he's saying. And probably there's no part of Scripture that displays this love for Scripture as much as Psalm 119. And the psalmist over and over says, "Oh how I love your law and meditate on it day and night. I eat your words, I ponder them; they are my food." And he just delights, verse after verse — 176 verses of delighting in the law of God. And I think to myself how more should I as a New Testament believer delight in the whole counsel of God. We have better promises, the book of Hebrews tells us. We have the fulfillment of the life of Christ. And so I can love whatever the writer of Psalm 119 loved plus a whole lot more. And so, for me, to love the Scripture means that I love the God who gave it. And then it means that I really delight to obey what he said. And more than anything, we are to love Scripture and its testimony to our Savior Jesus Christ. It says in John 1, "In the beginning was the Word." There's such a close link to the written Word of God in our experience of Christ. I don't know anything about Jesus except from Scripture. I can't learn about Jesus from clouds or mountains or rivers. I learn about Jesus from special revelation, from God communicating through Scripture who his Son is. And so, I love Scripture because it points me to Christ and gives me Christ. And I can feed on Christ as living bread by reading Scripture. So it's really important for us to love Scripture. We love many things in life. We love our country, parents, our sons and daughters and many hobbies. And this makes us move forward to get to know them more. So, if you love the Bible, you will love to study the Word, study the Bible and dig deeper to know its facts. Usually, if you study something you love, you advance in its field. And if we love the Bible, we work on studying and understanding it, and put in time and effort, and look for references to understand it more… In my experience, the more I study the Word — the more time I spend in understanding and verifying its meanings and looking in dictionaries and reference books — the more I love this Word. Many verses in the Bible say that studying the Word is like eating honey. It is extremely sweet because it gives spiritual and mental satisfaction. In fact, studying the Bible fills us on every level. How many times do we get more knowledge, and then our minds are open to understand more? And how many times while we read and study the Word, God speaks to us and we start to pray and talk to him. This produces fellowship with him. As a result we love God and his Word. And his word lives in us, and we apply it to our life and we live for him. And all that happens through practice. There is a common Arabic proverb that says, "With distance the heart grows stale." So, if the person lives by the word and studies it, he will love it more and more and he will grow in this love till he starts bragging about it, that he and the Word are one. The more he is into the Word, the more the Word is in him and works in his life to show its virtues and wonderful meanings, especially the person of our Lord Jesus Christ. We ought to love, cherish, delight in Scripture. I read at least one paragraph every day out of Psalm 119, and over and over again the psalmist is saying, "How I delight in your law, how I love your precepts." And to kind of catch that fire for Scripture, I think it's an exceedingly important thing. You know, the Jews were known as "the people of the book." Oh, that we could become the people of the book. But we march beyond the book to what the book is trying to tell us to do and the things the book is trying to tell us to love: Love God with all you heart, soul, mind and strength, and love your neighbor as you love yourself. Very important things, but we need a passion for this book. 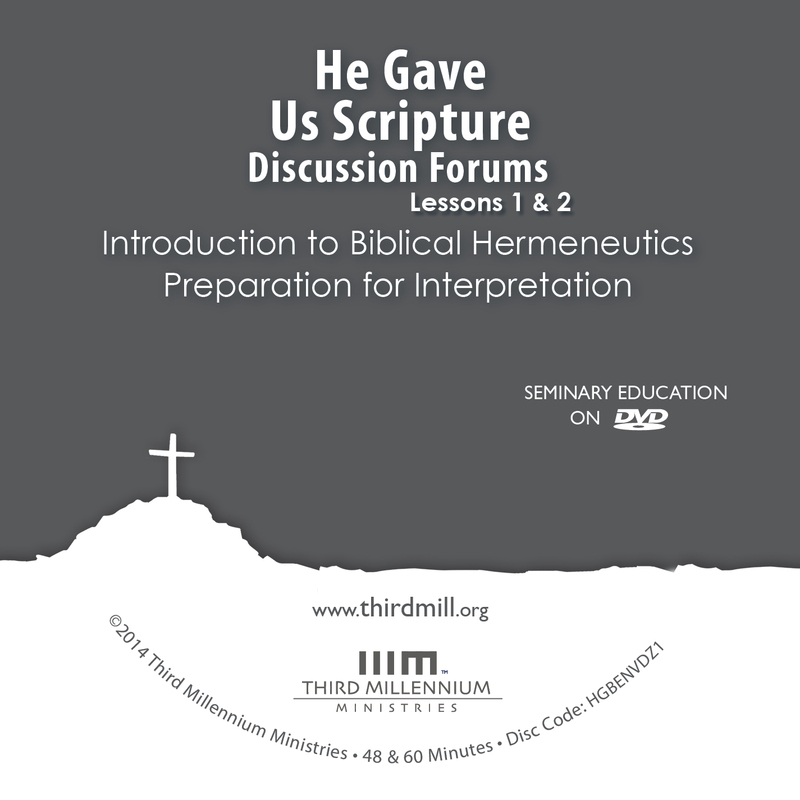 Devotional hermeneutics focuses on our need to draw near to God as we interpret the Scriptures. This means that we always have the author of the passage we are studying right there with us. Since we always have access to God as we study the Bible, what part does prayer play in biblical interpretation? I do think prayer is a very essential part of our interpretation of the Bible. And that's because when we are studying the Bible, we're not only studying an historical document or a literary document, but we're actually seeking to meet with God himself. Jesus teaches very clearly what the rest of the Bible also teaches that spiritual things are spiritually discerned. Of course, that's the language of Paul. Jesus says something similar in John 7. "If you desire to know the truth, you will understand that I am from God," Jesus says. Those are just a couple of hints of the reality that interpreting the Bible is more than an intellectual exercise. It is a spiritual experience, a spiritual exercise itself. And so it stands to reason that we should be praying and seeking the Lord before, during and after sermon preparation, personal Bible study, devotional reading of all sorts, because that is part of what it means to read the Bible well. Biblical interpretation really begins with prayer, because when we come to the Bible to understand the Bible and then perhaps also to teach the Bible to others, we're not standing over God's Word trying to use it to do things that we want to do with it. We're sitting under God's Word. And the way we bring ourselves into submission to God's Word is to pray for the guidance and help and direction of the Holy Spirit. And the same Spirit that inspired God's Word also guides us into an understanding of God's Word. We invite that work of the Holy Spirit through prayer. Prayer is a vital part of the discipline of reading the Bible rightly and reading it well. If we think about the fact that we have access to the divine author whose meaning we are really after when we read the Bible, then why would we not be in conversation with the author if we could possibly be? And, of course, we can, and that is prayer. There's another aspect to this, too. Prayer has been given to us by God as a kind of discipline to practice in our life that is helping us greatly to come into ever greater conformity with his Word and with the likeness of Christ. And so, that also is a critical aspect for becoming a better reader of Scripture. Sin blinds us. Sin twists us. Sin defends itself against the Word of God. Sin does not want to feel the weight of the Word of God. Prayer is able to attack sin in certain ways and to overcome this and to bring us to repentance and confession of sin and so on. And this is a vital part of becoming an ever better reader of God's Word. There are at least two ways to approach any subject. We can simply develop an intellectual understanding of it, or we can use our knowledge for action. This is true for the Bible as well. Those who simply read what it says will have a different understanding of it than those who do what it says. How important is it for us to put our knowledge of the Bible into practice? James is inviting us to know the Word and then put it in practice, "Do what it says." If we don't, we're deceiving ourselves. And he uses the illustration of the man who looks at himself in a mirror, and when he leaves he forgets how he looks in front of the mirror. There is a particular calling to not only study the Word, not only listen to the Word, but put it into practice too. When this doesn't happen — and frequently it doesn't happen — we are in disobedience. The only reason to study the Word is to obey it. If we aren't going to obey it, then don't study it. In fact, we'll be in a worse place if we study it and we don't obey it then when we only have the knowledge. We have to study it and then put into practice what we've learned. And then the Word will literally rule over us. It's not an option that we have. It's a mandate to be "doers," or someone who practices the Word. If we don't, we'll live in disobedience. Unfortunately, there are many Christians, many believers, and sometimes even leaders that live in disobedience because they are listeners but not doers of the Word. Jesus said that you should be very careful how you hear. And he said, "To the one who has even more will be given. The one who does not have, even what he has" — go figure — "will be taken away." And I think what he's saying to us is there are ways in which we have to be careful how we hear intellectually. But then practically, there are ways in which we have to be very careful how we hear. In other words, he's saying that if you don't put it into practice, you're going to lose it. If you put it into practice, you'll be given more. So, I don't think that we can expect to grow in our understanding of the Bible unless we're putting into practice what we're hearing as we hear it. Also, if we don't put it into practice, we don't become very effective teachers for other people because we're only talking about something that we have no experience of. But if we have experience of it, we'll talk about it very differently. For example, if I'm trying to put into practice loving my wife, I'm not going to be too hard on you because I know how hard this is — or really, I should say it's hard for her to love me. But I know how hard it is. We need the grace of God. And so there'll be a graciousness in my presentation because I've been trying to put this into practice, and I know how difficult it is. On the other hand, positively, as I put it into practice, I know how important it is, and therefore there will be a sense of urgency as I teach this to other people. So there's a spiritual context as well as an intellectual one that is only enhanced as I put into practice what I'm interpreting from the Bible. It is absolutely vital for us to put what we learn from Scripture into practice in our everyday lives. The Lord means to transform the way we live by the renewing of our minds, Romans 12. Jesus said if you know these things, you'll be blessed if you do them. Jesus said make a tree good and its fruit will be good. He wants it lived out. For us to not seek to put into practice the things we're learning means we're just gaining head knowledge… Knowledge puffs up, Paul said, but love builds up. And so our desire is to be transformed in the way we live. But we can't do the opposite thing which is just look good on the outside and have a shiny, you know, pleasing life on the outside. Then we're hypocrites at that point. We're being actors. We're like those white-washed tombs. So there has to be a complete integration of a transformation of the heart that leads to a whole new way of living. In Romans 6 Paul said, don't you know that when you present yourself to someone to obey them as a master, you're a slave or a servant to the one whom you obey. And so we show that we are Christ's servants by obeying him in everyday life. So many verses teach us that Christ the King wants to be, demands to be, obeyed day after day. And Scripture is given to help us do that. It tells us what we're to obey. It gives us commands, many of them, and those commands really do chart the course of a godly life. So after we've come to faith in Christ, we then are brought back by the power of the Spirit to the laws of God so that we can live them out in everyday life, not for our justification but for our godly living and fruitfulness. So, it's absolutely vital for us to put into practice the things we learn from Scripture. I think it's extremely important that when you read something you do put it into practice. I had a hermeneutics professor that said one time, "You do what you believe and you believe what you do." So, all knowledge eventually comes out in terms of: I am applying this to my life. Now having said that, the Old Testament word in the Bible for "know" was "yada," which meant not just intellectual capacity, but it was "to encounter" or "to experience." So, to know God meant that you were encountering him, you were experiencing him, which goes far beyond just what's going on in your brain but goes to entire lifestyle. As we interpret Scripture, both scientific hermeneutics and devotional hermeneutics become important. In a very real sense, they provide a healthy balance between an overly intellectual approach to interpretation and an overly emotional approach. And as this balanced approach becomes more natural, so does our fruitful interpretation. As a result, we can apply the Scriptures to our own lives in ways that help us live out God's Word and glorify him in our world today.